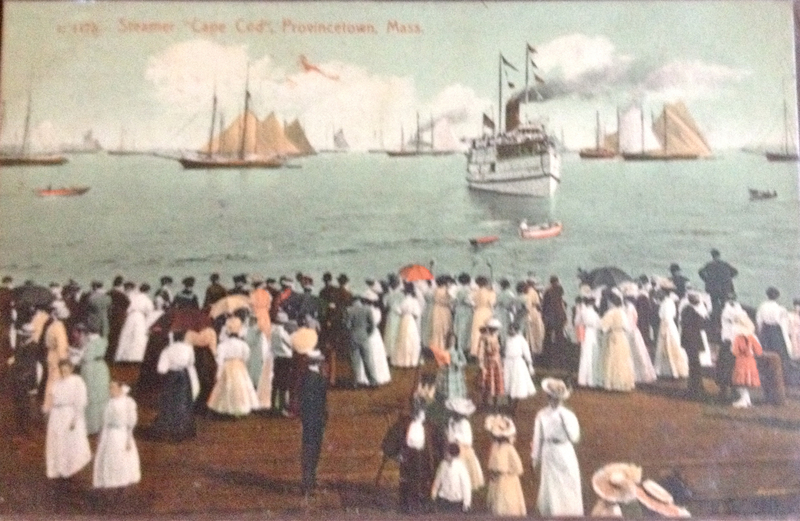 This antique postcard was mailed from Provincetown, Massachusetts to Binghamton, New York in 1911. Provincetown harbor is filled with handsome sailing vessels. Awaiting the arrival of the steamer ferry from Boston are a host of tourists and residents, dressed for a summer’s day with broad brimmed hats and parasols. Visitors still travel back and forth from Boston to Provincetown on the Fast Ferry. Some of the characters in the new murder mystery novel Remaining in Provincetown once lived in Boston but decided to relocate to Provincetown. Why? Does it have anything to do with the mystery of who killed Sonny Carreiro? You’ll have to read the book to find out. Now available in bookstores and online. Purchase your copy in paperback or as an ebook. Like us on Facebook and keep the conversation going. Posted on August 17, 2013 by S.N. Cook. This entry was posted in Cape Cod, Provincetown, Transportation and tagged antique postcard, antique postcards, boston boat, Cape Cod, Cape Cod artists, Cape Cod Bay, Fast Ferry, mystery novel, new novel, old postcards, Provincetown, provincetown cape cod, provincetown massachusetts, Remaining in Provincetown, Remaining in Provinetown, transportation, vintage postcard. Bookmark the permalink.